The scourge of English batsmen is to be honoured for his achievements in cricket - by an English university. Shane Warne will receive an honorary doctorate from Southampton Solent University at a special ceremony at Hampshire's Rose Bowl on Wednesday. The Australian cricket legend will wear customary academic dress to receive the degree, which recognises his role promoting the game and his Test haul. 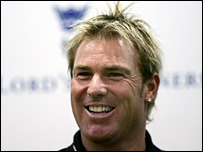 It will be a double celebration for Warne who also turns 37 on Wednesday. Professor Glyn Tonge, pro-chancellor and chairman of the university's board of governors, said: "As arguably the greatest bowler who has ever lived, Shane Warne is highly deserving of this honorary doctorate. "His sporting success is an inspiration to all. "We felt it was only fitting to break with tradition and confer this degree at the Rose Bowl, the home of Hampshire cricket." Warne, who is the leading all-time Test wicket taker with 639, has played for Hampshire since 2000 and currently captains the county.